GERD diagnosis often means you will need to make diet and lifestyle changes. 1. A Little Back-Story: Now in those days, Elena hated the term “obese.” But she knew she needed to lose 38 extra pounds from her 5’4’’ frame. However, her health was good except for the occasional virus or a little heartburn. Scenario On the Fateful Night of GERD: At first, Elena’s 45th Birthday dinner was a huge success. She had to admit she looked good in her little black dress, although it was a little tight. 2. The Birthday Party Made for GERD: Friends and family arranged a beautiful dinner of steak, lobster, corn-on-the-cob, and French fries. They continued celebrating after dinner with slabs of red velvet cake, and home-made vanilla ice-cream. By the time she unwrapped her nine-year-old daughter’s gift of a golden box of imported chocolates, she was not feeling well. 3. Temporary GERD Relief: When the guests departed and the children went to bed, Elena self-diagnosed her own heartburn. She was contented to pop a couple of over the counter antacids. 4. Setting a Perfect Stage for GERD: Her husband started her favorite chick-flick on the DVD player. Since she felt a little better, she flopped into her favorite recliner, sipped a stemmed glass of champagne and chain-smoked three cigarettes. Little did she know that very shortly she would feel like liquid fire and lava was surging up her throat and her party night would end up in choking gasps and liquid coughs in the emergency room. It was the next morning at her doctor’s appointment that she first heard the details about GERD. GERD symptoms can be mistaken for heartburn or a heart attack. As you continue following Elena’s story in this article and Part Two, you will see that Elena had spent the evening collecting perfect signs and symptoms of GERD. Upon later reflection, Elena realized that every two or three weeks, some family member or friend had a party. 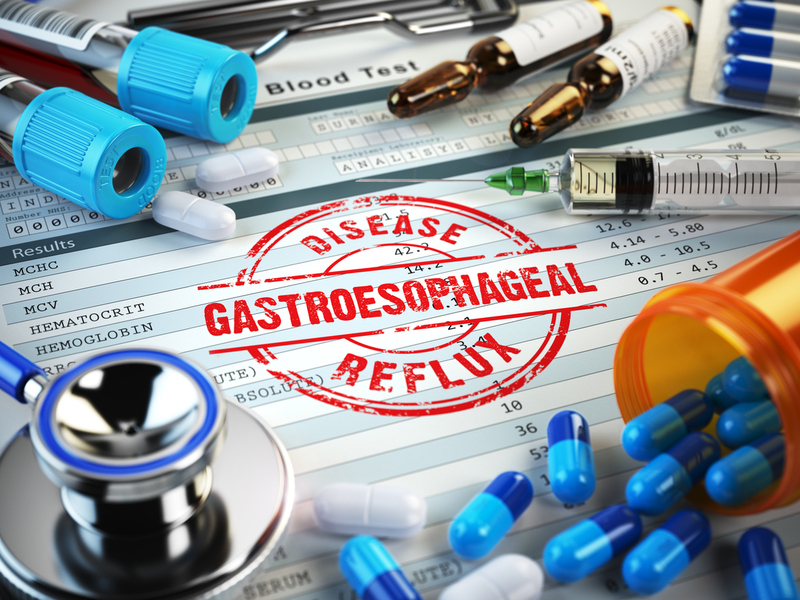 Whether she was a guest or guest-of-honor, her symptoms and lifestyle were adding up to gastroesophageal reflux disease, GERD, or “Gertie” as she came to name it. To the patient, Elena, the reflux felt like hot, corrosive lava and she coughed and choked. There was even a little blood, which really frightened her. With repeated irritating episodes of reflux, inflammation might intensify. And left untreated, even bleeding and scarring of the esophagus and other complications can occur. We will discuss them in Part Two of this blog topic. Several factors might explain and shed some light on Elena’s condition. Likewise, buried in this little story are some and clues for relief from the hot spasms of GERD. Patient Describes GERD Pain as a trial by fire in the throat and chest. Red Flag 1. Those Extra Pounds: Her obesity and little black, tight dress caused undue pressure on the very part of the body that houses the lower esophageal sphincter. Red Flag 2. The Feast: Large sized meals can overload the esophageal sphincter or over-stress its function. The Digestive Disease Consultants often recommend small meals as a change in lifestyle. There is a fantastic, very effective treatment for night-time acid reflux attacks, in addition to the waiting period before you lay down. If you are experiencing heavy acid or reflux nightly, we believe you should elevate the head of your bed. Caution: We do not mean for you to do this with pillows. Pillows will cause your body to curve and might intensify your discomfort. With wood or cement blocks under the feet of your bed, simply elevate the head of your bed about 6-9 inches. The above Red Flags were central to Elena’s GERD attack and diagnosis. She added one last irritant to the mix when she smoked the cigarettes. Patients are often very aware that cigarettes harm the respiratory system. But Elena and many other GERD patients are surprised to know that smoking can directly exacerbate digestive problems. In her case, Elena eventually admitted smoking was tantamount to throwing gasoline on a fire. The Digestive Disease Consultants of Orlando invite you to follow the story of Elena and her “Gertie,” in next week’s blog. It reveals her testing and treatment for GERD. Follow her journey into a new lifestyle after her trial by fire.